375. Rope Materials.—Roj)e is made from a number of different vegetable fibers, including manila, sisal, and cotton. Most of the rope used on the farm is made from manila or sisal fiber, or a combination of the two. Manila fiber is made from the outef portions of the abaca plant, which resembles the banana plant and is grown in the Philippine Islands. The best grade of manila fiber Is light buff in color, has a silky or lustrous appearance, is fine, uniform in size, flexible, and from 6 to 12 ft. in length. Sisal fiber, which comes from a plant grown in Central America and Mexico, is somewhat coarser, stiffer, shorter, lighter in color, and weaker than manila fiber. 376. Relieving Kinks.—A new rope frequently causes trouble on account of kinking. This is because the right and left-hand twists of the fibers, yarns, and strands have not been equalized. The trouble can be remedied in the case of a short rope b}' fastening one end to an overhead beam or support and tying a weight to the free end. A long rope may be dragged slowly over a pasture or other reasonably smooth surface, thus allowing the free end to revolve and to equalize the twists in the parts of the rope. of a coil, it should be unwound in a counterclockwise direction. If it starts to uncoil in a clockwise direction, turn the coil over and pull the end up through the center from the other side. Fig. 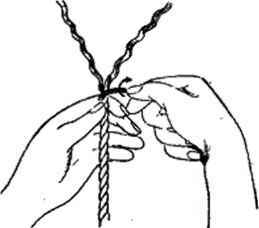 316.—a good way to coil a small rope is to wrap it loosely around the flexed left forearm in a right-hand direction. 378. Avoid Abuse and Keep Rope Dry.—Care should be exercised not to draw a rope over sharp or rough objects that might wear or break the outer fibers. Nor should a rope be used over a pulley that is too small in diameter. The diameter of the pulley should be at least eight times the diameter of the rope. Ropes should not be exposed to dampness or moisture more than necessary, nor should they be left damp under poor conditions for drying, as dampness tends to rot the fibers. 379. Re-laying Strands.—If the end of a rope becomes untwisted, and the strands stay in good condition, they may be easily re-laid. The rope is held in the left hand while the right hand twists one strand tightly to the right (see Fig. 317). The left thumb is moved up the rope to hold the twist in the strand. In like manner the other two strands are t wisted in turn, and the process continued until all the loose Fiq. 317. Re-laying strands. brands are re-laid. 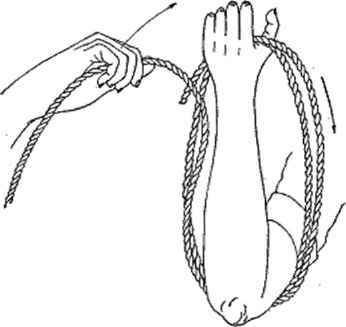 It is best not to rotate the rope in the left hand, but to simply move the hand straight up the rope. 380. 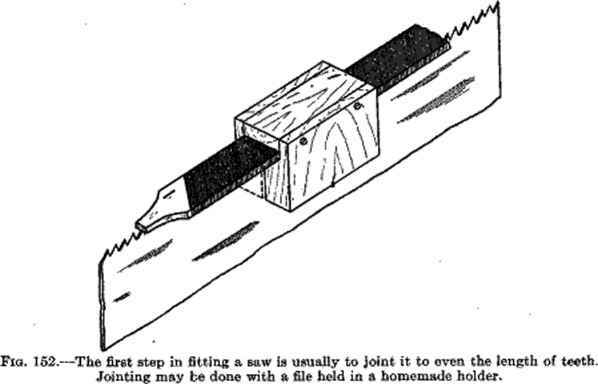 Whipping.—This is a neat and effective method of preventing the ends of a rope from untwisting and is recommended when the rope must pass through small holes. Pig. 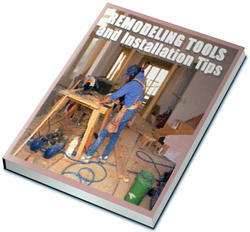 318.—Whipping an end of a ropo is an cffcctivc way to prevent fraying. 1. Unlay one strand of the rope back an inch or two from the end (see Fig. 318). 2. Place one end of a stout cord, to 3 ft. long, under the raised strand, leaving the short end of the cord 6 or 8 in. long; and then rc-lay the strand. 3. Hold the end of the rope up, letting the short end of the cord hang; do\\rn. 4. Wrap the long end of the cord once around the rope, just above the short end. 5. Pull the short end of the cord towards the end of the rope and turn it back, forming a bight. It is best to lay the sides of this bight in a groove in the rope. 6. Wind the long end of the cord around the rope and the bight, keeping the turns tight and close together. 7. When the wrapping has progressed as far as desired, pass the long end of the cord through the bight, keeping it tight. 8. Pull on tho short end of the cord, drawing the bight back under the wrapping to about the center. Cut off the loose ends.